Today, our children are lucky if they are afforded access to an after-school music program as public education continues to fight wars of overcrowding, underfunding and the like. It's a complicated mess that too often gets boiled down to something like "math is mandatory, music is optional". So now what? Well, this may be a place where virtual worlds can preserve if not reinvigorate the arts for kids. SecretBuilders, a virtual world that immerses children in the creative arts, and San Francisco Opera, the second largest opera company in North America, have joined hands to bring Mozart, classical music, and opera to young adults. 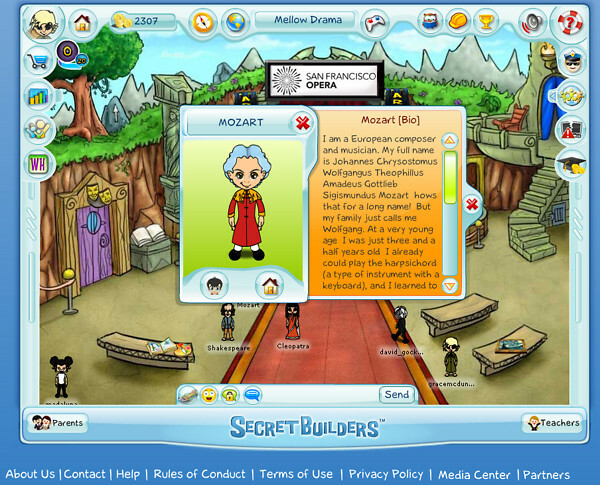 SecretBuilders officially launched in December 2008 as a virtual world for children from 5-14 years of age. The world is packed with everything you might expect in a kids virtual world including quests, game, homes and pets and social gatherings. But unlike other popular worlds, SecretBuilders weaves awareness, education, creativity and cultural literacy into the world activities and events. SecretBuilders residents live and play among fictional and historical characters such as Shakespeare, Galileo, Mozart, Oliver Twist, Plato, Van Gogh and Amelia Earhart, and while doing so, learn concepts from the arts and humanities. They go on quests, publish artwork and writings, play casual games, enter contests and participate in an extensive virtual economy and social life. Residents are also given the tools to build out this virtual world with their own ideas, activities and actions. Magazine: The Crooked Pencil, our online magazine allows children to publish their writings and comment on what others have written. Charity and Fundraising: One For All allows students to raise money for their schools by answering questions (Math, English, Geography, etc). Correct answers generate cash for their school or charity and improve their own skills. BuildIt! : This is a unique SecretBuilders feature which allows kids to help build out this world with their ideas and perspectives. Much of what you see on SecretBuilders today was generated by a child’s imagination (and a little development help from us!). Contests: Creativity, challenge and great prizes are the hallmarks of our contests. We have just launched the following contests: "Dear President Obama” where kids send a picture message to President Obama; the Kid Inventor Challenge where kids design a toy that will become a “real” toy in SecretBuilders; “Help the Kelp” in partnership with the Monterey Bay Aquarium to restore life to the Kelp Forest; and the Frank 'n Stein an Art Coloring Contest. It sounds great, but does this work? The National Parent Publications Awards (NAPPA) seems to think so. 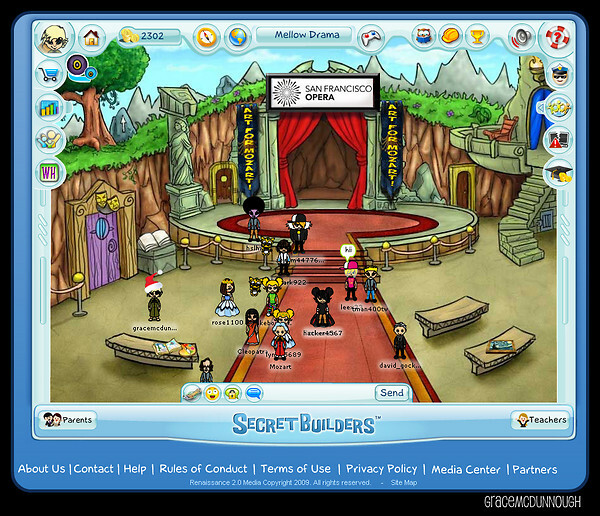 This year SecretBuilders was a 2009 NAPPA honors winner in the Children’s Products competition. Thanks to this recent partnership with the San Francisco Opera, SecretBuilders residents can meet and chat with Mozart in "Mellow Drama" the virtual amphitheater and talk directly to David Gockley, General Director of San Francisco Opera, whose virtual avatar will be alongside Mozart welcoming kids to the online contest. But that's just the tip of the experience. There is also an “Art for Mozart” Contest that challenges residents to design a poster for Mozart’s “The Magic Flute” telling the story of how Prince Tamino rescues Princess Pamina from an evil magician. Audio and video clips of the opera are provided by San Francisco Opera and the “Art for Mozart” contest is also supported by KidZui, Art in Action, and Stone Soup Magazine. The contest ends January 31st, 2010 and winners will receive a variety of prizes including SecretBuilders memberships and tickets to an opera. And while you are basking in the warm glow of your favorite boy/girl band, allow me to leave you with this machinima - shot in SecretBuilders.